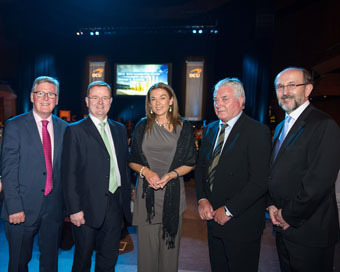 The annual DCU Leadership Circle Dinner was held last week to recognise the support of key business leaders for DCU initiatives driving economic and social change. The event was hosted by President Brian MacCraith and DCU’s Educational Trust, and keynote speaker Terence O’Rourke, Enterprise Ireland, addressed the audience on the effects of investment in education on Ireland’s progress and prosperity. – Claire Bohan was awarded on the night for her commitment to student wellbeing in DCU and for her leadership of a new programme to provide students with the resilience they need to flourish in university and bring valuable competencies and skills to the workplace after graduation. – Bank of Ireland received an award for its long-term support for DCU, most recently for its backing of an Entrepreneurship and Innovation Hub in the new Student Centre. This hub will provide facilities for students to hone their business skills in a collaborative environment. – Pat McDonagh, founder of a number of successful educational technology companies including Avoca Learning, was recognised for his support of two vital DCU initiatives, UStart and the Sports Scholarship programme. Attendees on the night included Mary and Martin McAleese, Bill Cullen and Jackie Lavin, Liam McLaughlin, Chief Executive of Retail for Bank of Ireland, Caroline Keeling, CEO of Keelings, Cel O’Reilly, Managing Director of Philips Electronics Ireland and Tadgh O’Shea, VP of Software Engineering at Fidelity Investments.